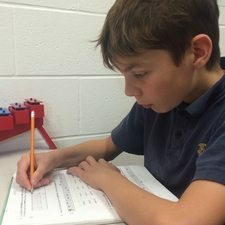 Motivation Ideas to Complete Homework! Three Motivation Ideas to Complete Theory Homework! How do we get Boys (and Girls too!) to Complete Theory Homework? In my blog "Complete Theory Homework", I presented 3 Motivation Ideas on how my students complete their Music Theory Homework. Meg Freer, an amazing teacher in Kingston, Ontario, wrote me this message: "I enjoyed the UMT email about completing theory homework on time. Interesting, though, that your 3 examples of students are all girls! Any boys? That's a whole different can of worms!" In looking at my private studio, I teach 29 girls and 23 boys. For some reason, the evening that I wrote the "Complete Theory Homework" Blog, I was inspired by the 3 girls that had lessons back-to-back. So, today I am going to look at 3 Motivation Ideas that have worked extremely well for the boys in my studio (and the girls too!). Jonathan loves exploring music. 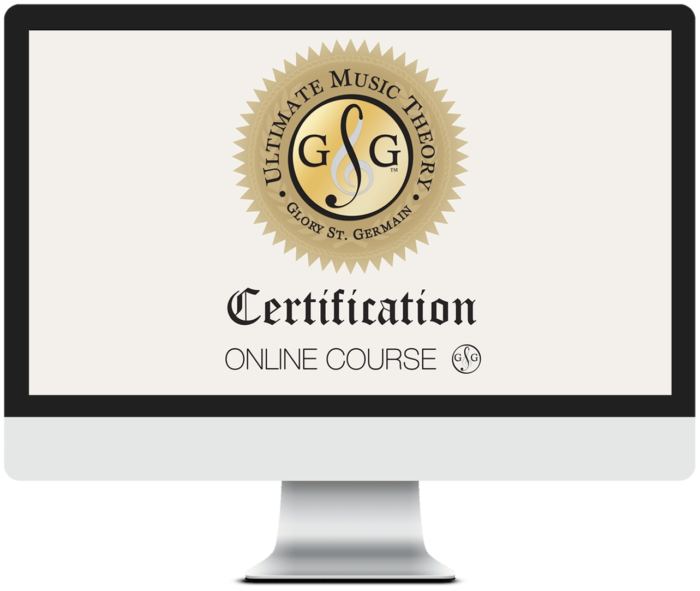 When he completes a page in his theory correctly, we like to take the page to the piano, or the stepbells or the bongo drums. Today, using Prep 1 Rudiments Page 85 exercise #4, Jonathan tapped the Basic Beat with his left hand and tapped the rhythm with his right hand. 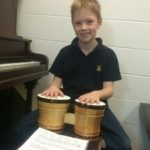 By using the bongo drums, Jonathan was able to see, hear and feel that steady Basic Beat AND the rhythmic pattern (notes and rests) at the same time. "It was kind of like a challenge." said Jonathan. "After trying it separately, with the left hand and then the right hand, I got the beat and I knew what my rhythm was. When I got the hang of it, I put it hands together and it wasn't hard! I did it!" 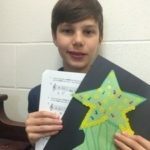 Jonathan is preparing for his Prep A Royal Conservatory of Music Piano Exam. By working through the Prep 1 Rudiments workbook, he is also learning the concepts required to successfully complete the Ear Training and Sight Reading components of his exam. By using Exploration as a Motivation Idea, students want to complete their theory every week! They know that they will have a fun activity to do when we mark their theory homework. Ethan likes to be "challenged" and to earn "rewards". In his piano, he loves to do "metronome challenges", earning stickers for playing a piece at different metronome speeds. With Ethan, I use the Motivation Idea of "Challenge and Reward". This picture was from our "Reach for the Stars" Challenge - Students were motivated to earn stickers for going out of their way to do something awesome - for putting in that extra effort to "reach for the stars". For a student like Ethan, who often does not take "utmost care with his notation" (in other words - he rushes and his work can get sloppy), being challenged to write all accidentals perfectly to earn a sticker definitely made a difference. Our next challenge is a "Let it Snow" Challenge - Every Page of theory completed earns a snow flake sticker on the student's snowman. This is Jonathan's "Before" picture. I like to take a picture of each student with their "empty" challenge and then, when the challenge is over - usually 2 or 3 months later - I take another picture with their "completed" challenge. By using Challenges and Rewards as a Motivation Idea, students want to complete their theory every week (and they want to complete it neatly if they know that I am going to be looking for "awesome notes" or "amazing accidentals"). They like putting stickers on their Challenge Chart (yes, even my 17 year old male student!). Motivation Ideas #3 - "Finish"
Aydan does not like to "do" his theory at home - he likes to "finish" his theory at home. 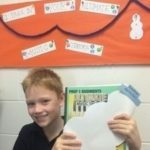 By completing a few questions (or a few parts of each question) at his lesson, he knows that he can finish it at home. He doesn't have to worry about not understanding something, or about struggling with a concept since we have already completed one or two examples at his lesson. 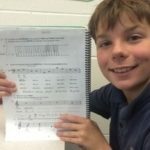 Reviewing his "homework" together at his lesson also allows me the opportunity to add any relevant Memory Joggers directly in Aydan's Ultimate Music Theory Workbook. Completing his theory at home isn't scary when all he has to do is "finish" his work (instead of "doing" it all by himself). By changing the word "DO" to "FINISH", students want to complete their theory every week. They know that they will get to spend time having fun at their lesson learning new concepts. Keep on Learning... With a Smile and a Song!